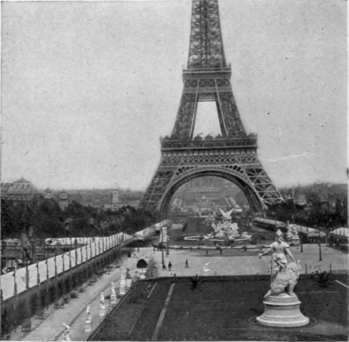 This section is from the book "Paris and France - John L. Stoddard's Lectures", by John L. Stoddard. Also available from Amazon: John L. Stoddard's Lectures 13 Volume Set. 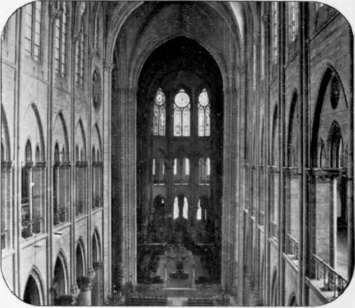 The tourist will be well repaid if he ascends the towers of Notre Dame to gain a comprehensive view of Paris. Directly beneath him he discerns the Seine, which here shoots onward like an arrow under bow-shaped bridges, dividing palaces and gardens in its flight. Outlined distinctly against the sky, although two miles distant, is that recent acquisition of the ever reared by man, yet graceful and symmetrical from base to summit. 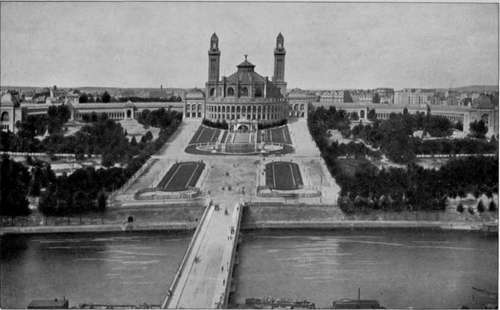 Not only did it form the chief attraction of the Paris Exposition, but it still remains a permanent object of embellishment, visited in summer every day by hundreds, who are conveyed in elevators to its different stories. It is astonishing to learn that forty draughtsmen worked for two years on the fifteen thousand different sections of this tower, each of which required a separate design, exact to the one hundredth part of an inch. In one hour, two thousand, three hundred persons can be lifted by the elevators to the first and second galleries and seven hundred and fifty to the top. Upon the steps, and in its corridors, restaurants, shops, and theatre, ten thousand people can assemble at one time. 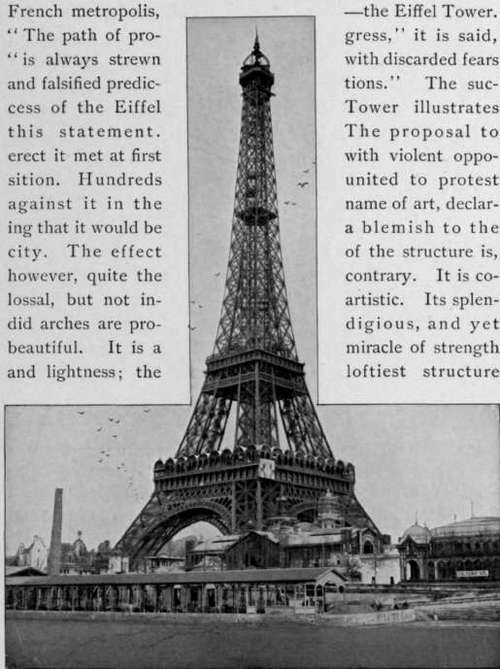 When crowded, therefore, the Eiffel Tower is like a vertical city, - a metropolis in a tube, a thousand feet in length, and letters posted there by its aerial citizens descend and go forth to the world by all the daily mails. Looking down from the Eiffel Tower, one sees, not far away, a building which, in architectural design, has few superiors in Paris, - the Palace of the Trocadero. 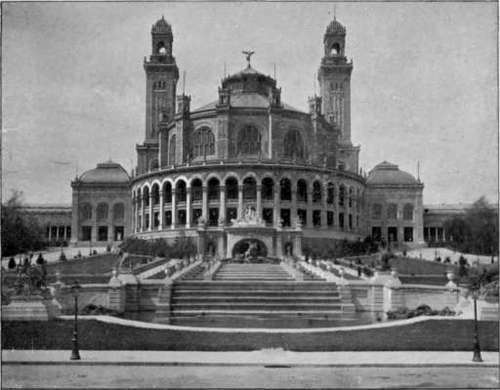 Although designed as one of the features of the Exposition in 1878, it still forms one of the permanent attractions of the city. How well French artists understand the art of utilizing perspective! 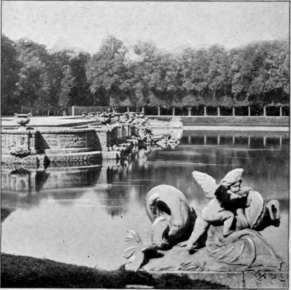 The gradual approach to this imposing structure is rendered beautiful by a most skillful and harmonious grouping of flowers, lawns, and fountains; and when, on festal nights, like that of the 14th of July, - the anniversary of the taking of the Bastille, - the palace and cascades are all illumined, the effect can never be forgotten. The name, Trocadero, is derived from a Spanish fort at Cadiz, captured by the French in 1823. There is, however, nothing Spanish in the architecture of the edifice. It savors rather of the Orient. Its lofty towers, each two hundred and seventy feet in height, recall the minarets of Cairo, and, with its curving galleries to the right and left, it has the form of a colossal crescent. Although called a "palace," the Trocadero is, strictly speaking, a palace only of the arts and sciences. In the main body of the building is a concert-hall seating six thousand persons, and in its curving wings are some of those artistic and historical collections which have now become so numerous in Paris that, if united, they would fill to overflowing another museum like the Louvre. The Trocadero From The Seine. - the Grand and Petit Trianons; and a third, after a little interval, to a review of the whole.